The East Malling Blog: No Sweets 'n Treats? How the mind wanders. I'm currently on the train to East Malling from London and thought it would be a good idea to introduce some present information to the blog to counter-balance the marvelous historical facts we have learned so far. 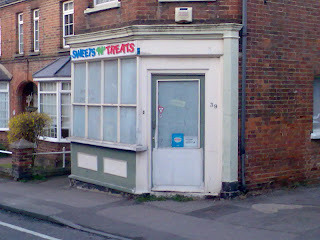 Since I moved to the area last September I have wondered about the disused Sweets 'n Treats shop on the High Street with the greyed-out windows. Did this used to be the village newsagents? And, if so, are there any plans to reopen it? If anyone knows the answers please post or let me know. the actual baking used to be done in the buildings to the right of the shop. the supermarket was where the indian resturant was(now closed) and rightly so this is the bakers shop with the bakery next to this remember z-cars ? Michael. Yes, Hunt's bakers shop. The bakery was the building with the outside staircase on the other side of the side entrance lane. Yes, Diamons (or was it Dymond's?) was the house next door to the "Old Post Office" at the bottom of High St. To me, though, this would have been the "New Post Office"! In the 50s the post office was in Jenner's shop at the top of High St (I think it is now a hairdressers) next door to what was once The Ship Inn. My parents got their weekly grocery order from Dear's shop on the corner of Church Walk but I used to go into Diamoms to swap Brooke Bond and Typhoo tea cards in their swap rack. Yes it was Hunts Bakery .I remember how much I enjoyed walking passed it to go to Clare Park School the aroma was something to enjoy.My sister in Laws family were the Hunts. Hi, It was a bakery in the 1970's because I worked there when I was 16. It was my first and best job ever. We used to do the baking out back and my job was to cream all the cakes :D I am still a cake addict. They were the nicest couple, I was allowed to scrape the bowls and eat the cream when we finished. I have such fond memories. I was born at 13 four acres in the early 1960's.